VectaVane is a "no nonsense" self steering device for sailing boats. It is based on a principle developed by "Blondie" Hasler. VectaVane is easily removable and despite its apparent simplicity has been carefully designed for optimum performance together with a satisfactory tolerance of harsh operating conditions. 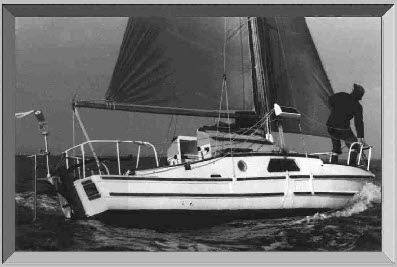 All materials used in the construction of VectaVane are Marine grade, for a long and useful life. Why do I Need a Self Steering System? It not only removes the monotony and fatigue from constant helming but is essential for the sake of SAFETY. When sail changing, or just resting, adequate control of your vessel is essential. Among the variety of selfsteering devices available. The "Haslar" type windvane System, (requiring no electric power and very little maintenance), is generally acknowledged to be the most reliable and effective. “VectaVane” is a horizontal axis, servo pendulum, steering system, that is to say, the operation of the paddle is controlled by a trim-tab, by which the wind vane when displaced from the vertical position by the wind, causes the the servo-paddle to turn in the water flow. The subsequent pressure of water against this servo paddle makes it swing sideways as though describing an arc (as a pendulum) . 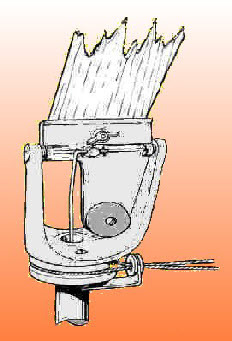 This sideways movement is transmitted to the tiller via lines and pulleys. 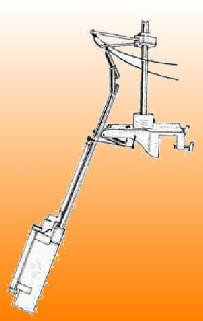 The use of the trim tab to control the paddle enables the wind Vane to be kept small and its linkage light. Course setting is a simple matter of turning the Turret by means of the Steering Lines until the desired course is being followed. Will ”VectaVane” Steer my Boat? At British Hovercraft Corporation, the device was towed at various speeds up to 12 knots, which was felt to be well above any speed likely to occur in normal use. At this speed, a steering force of over 100lbs (45kgs) was recorded, and there was no damage apart from a 3/16" (4.75mm) stainless steel split pin securing the pulley guides bending and pulling out. The expected failure at this speed, of an easily replaced part, is designed to protect the whole steering from serious damage. At a more reasonable speed, like 5 knots, tests showed that a minimum steering force of 25 lbs (11.25kgs) should be expected, more than enough to control, say a 30` (10 m.) cruiser. The forces referred to are measured from the tiller lines, and are directly available to the tiller so it is unlikely that your Boat is too difficult for VectaVane to steer. Below are graphs of test results of “VectaVane” obtained in the large tanks at Cowes IoW. UK. To assess the forces that your own boat requires to Steer. Sail down wind, this avoids measuring the confusing effect of leeway. Note the boat speed and with, say, a spring balance or similar, measure the "pull" both "port" & "starboard" which should be similar. If , as I strongly suspect, the steering forces required to steer your boat are less than the test forces (see under), then, yes! “Vectavane” will steer your boat. Should the self-steering strike an obstacle in the water while under way, a KICK-UP facility allows the whole support tube and paddle assembly to swing up, special ball joints on the linkage will allow this movement without damage. When the obstacle is cleared, the assembly is clipped back in position and the selected course continued. * Easily Removable & Transportable. * Tiller lines can be extended to any part of your boat. * Paint job is "two part" poly. * All bearings are of simple construction & stainless steel. * Castings are of solid aluminium. * Easily among the least expensive steering gears available. Approximate height of Mounting from WL is 26ins. (0.66m) & OAL. height from WL. is 74ins. (1.88m). Distance from Steering line horns and pulley assembly is approximately 37ins. (94cm). Distance between VectaVane and your Transom depends on the bracket of your choice.